Discontinued: The H-D Reserve line was retired and instead we now have the Limited Edition line. In 2012 we see the debut of L.E. Salted Caramel Truffle. It's "smooth, sweet-cream ice cream, ribbons of rich salted caramel, and decadent chocolaty truffles". Sounds the same to me! I've had my eye on the Reserve line for awhile now, but I just couldn't bring myself to spend five bucks for a pint of something that was so very unhealthy (11g of saturated fat). Well, the temptation was too much when I walked by and the reserve line was half off! Oh the excitement! The joy! ...the calories! I'm sure the amazon valley chocolate is fantastic, but it was that caramel's catchy blue container that had my eye. The exact description is "Fleur de Sel caramels covered in a chocolaty coating blended into caramel ice cream with caramel ribbons and French sea salt accents." After a few bites, you forget about the sea salt and focus instead of the zest of the caramel (enhanced by the salt that is). The Fleur de Sel caramels are these great little pea size cubes of chocolate and caramel tastiness. Oh so fresh: I cracked one open and they appear to actually be alternating layers of chocolate and caramel inside this tiny candy and I must say that impresses me greatly. The ice cream is excellent ofcourse, as is the caramel swirl. Put them together and you have one excellent ice cream. I was good, I only had 1 serving, but I really wanted to go back for more. Ya gotta love Häagen-Dazs, I just wish you could get this kind of flavor and quality in an ice cream that was just a -smidge- healthier. As I sit hear thinking about it, I realize that it's a rarity for an ice cream company to treat caramel with such respect. The only thing that comes close is Ben & Jerry's Cinnamon Bun, but that skips the whole chocolate vibe. 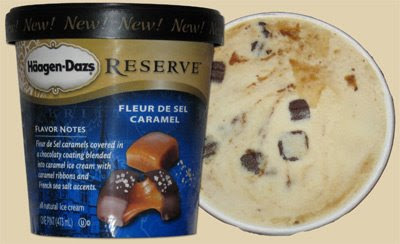 Who knows, maybe one of the main stream companies will come out with like a ROLOs flavored ice cream "Bits of bite size ROLOs in a caramel ice cream with a tasty swirl of some sort" ...wait! apparently I need to move to Canada. Hem...I tried it and I can assure you there's much better in this life..the real emotion is "Caramel fleur de sel" in gelato parlours....real Guerande salt grains on your tongue, wrapped with an indulging caramel cream on a delicious tofee gelato melting together. Fats? much less than the "reserve"...and as healthy as artisanal icecream can be. I tried it too! Italian Gelato called "Caramel Fleur de sel" such a full taste! and you can really feel the salt grains and not salted cream. It's incredible that it is made with real Guerande Salt. It's from Italy. Great taste, uncomparable to any other. B&J's Cinnamon Bun is my favorite ice cream, but this one sounds so incredible. I'll keep my eye out for it, but I'm sure I've missed my chance on a limited time flavor.